With 7:51 left in the third quarter, LeBron James slipped on an offensive set basket and was holding on to his groin. He asked to be subbed out with an apparent groin injury. He could be seen mouthing the words, “I felt a pop,” as he headed out of the game. Lakers fans held their breath as they watched their superstar leave the game. At that point the Lakers held a 14-point lead. That was an advantage they needed to protect against a complete Warriors team in Oakland. One of the toughest things to do in the NBA. True to their form, Golden State went on a searing blast. Curry nailed back-to-back three-pointers to spark the run. Andre Iguodala, the best Warrior at that point in the game added a corner trey off a Curry feed. Durant slammed home a two-handed hammer to complete the 11-point run and get the Warriors to within three-points. 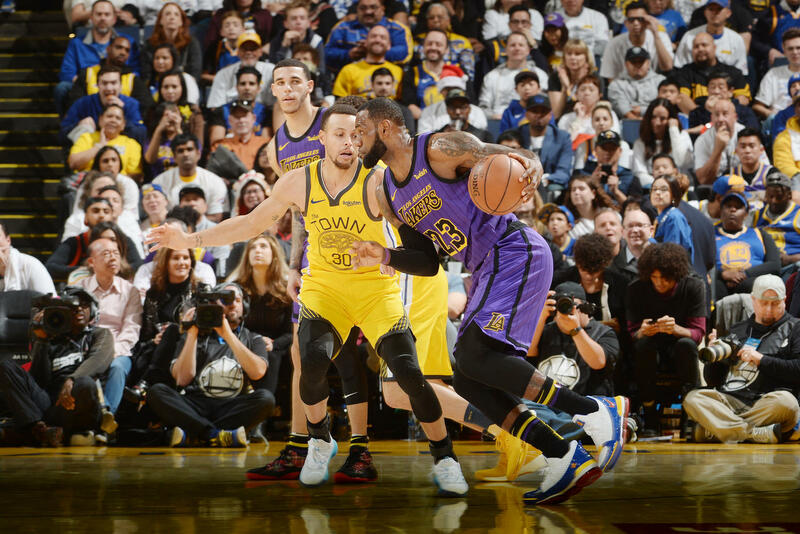 It would have been understandable for the Lakers to fold at that point, without LeBron, facing the vaunted Warriors’ All-Stars. Instead they took Golden State’s best punch and punched back. The rest of the team stepped up without their King. Rajon Rondo slipped into the painr for a couple of layups to stop the bleeding. Kyle Kuzma, Brandon Ingram and Kentavious Caldwell-Pope had key hits. Lance Stephenson hit a buzzer-beating three-pointer (and his signature air guitar) to restore a nine-point lead and give momentum back to LA. Ivica Zubac and Rondo teamed up to lead the Lakers on a 7-1 run to open the fourth quarter and rebuild the team’s 17-point lead. LA limited Golden State to just 19 points in the fourth quarter to cruise to the win. James led the Lakers in the first half and finished the game with 17 points and 13 rebounds. Rondo had 15 points and 10 assists of the bench. Kuzma led the Lakers in scoring with 19 points while Zubac added 18 points and 11 rebounds. This win proved that if James does miss any time with his groin injury, the rest of the Lakers are ready. "The narrative is that it's LeBron and the Lakers. Obviously we hope he's okay, but we've got a lot of good players… If he's down, we're ready to step up. None of us are scared of the spotlight." That wasn’t a game-winner but Irving made the most of the additional five minutes to make sure the result would be the same. Down two with two minutes left in OT, Irving stepped into a three-pointer at the top of the key to give the Celtics the lead. He followed that up with a pull-up dagger from the right wing to seal the win. Irving finished with 40 points and 10 rebounds to lead Boston. Giannis Antetokounmpo, a rising superstar in the league was given his first Christmas day game against the Knicks this year. He didn’t get the chance to get back at Mario Hezonja for the step over in their last game. He instead dropped 30 points, 14 rebounds, four steals and two blocks. In the meeting of the MVPs, James Harden came away with the win. The Beard continued his hot streak with 42 points, six rebounds and seven assists. He beat out Russell Westbrook who only had 21 points but with nine rebounds and nine assists. In the night cap, Rudy Gobert led the balanced Jazz attack with 18 points, 14 rebounds and seven blocks.